The recipe for these Mini Blackberry Cobblers was inspired by the blackberry cobbler my grandmother, Bessie, used to make. Blackberries grew in the wild near Bessie’s house, so sometimes she’d make the cobbler with fresh berries. However, more often than not she had a big crowd to feed and needed more berries than she could pick. In that case, she’d use frozen. I’ve made this recipe many times since posting, and since I make it to serve just 2 to 4, it’s easy to gather (or afford) fresh blackberries. I’ve also played around with the sizes and now think the best way to serve this in 10 oz size souffle dishes. If you are making it for 4 people and want very small cobblers, 4 oz porcelain souffle dishes will work, but the 10 oz size is more realistic. 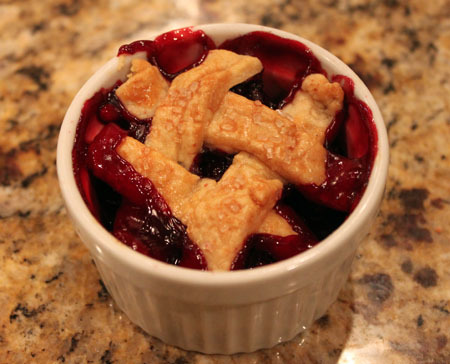 Mini Blackberry Cobblers are individual size cobblers baked in souffle dishes. The recipe will give you enough dough for 4 large and enough filling for 2 large, so if you want to make 4 large (10 oz) cobblers, double the filling only. Combine the flour, sugar and salt in a mixing bowl. Cut in butter and shortening until mixture appears coarse. Add 1 tablespoon of water and try to bring together in a ball. If dough seems dry, add more water. Shape into a disk, wrap in plastic and chill until ready to use. Combine sugar, cornstarch and cinnamon in a mixing bowl. Add the berries and toss until coated. Pour in the lemon juice and toss to mix. Generously butter two large ramekins (or 4 small) and divide berry mixture between them. Roll pastry into square or rectangle and cut it into strips that are about ¾ inch wide. Alternatively, you can cut shapes out with cookie cutters. Arrange strips in a lattice across top of each serving or just set a cut out shape of dough on top. 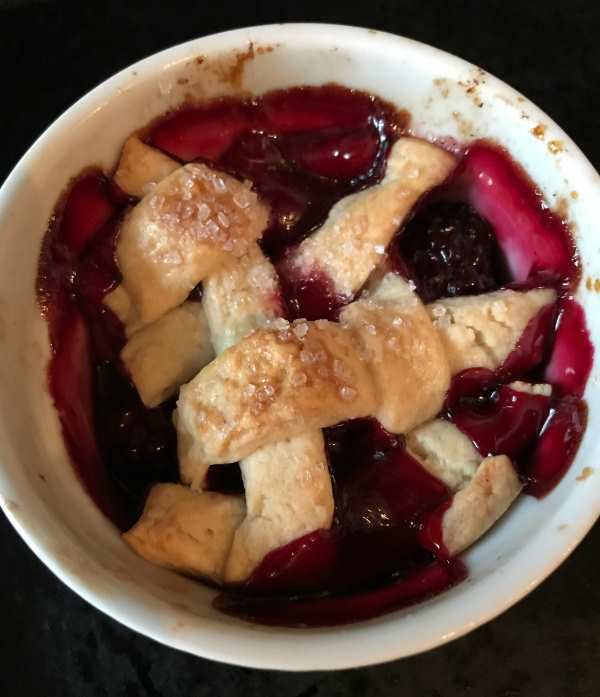 Brush strips with beaten egg, sprinkle with a little sugar, set on a cookie sheet and bake for 40 minutes at 375 F.
This is on my list for blackberry season this summer! 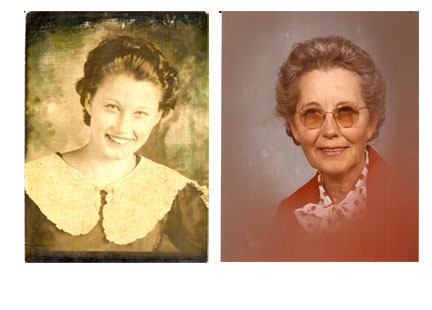 I love those two pictures of Bessie. It’s great to have a recipe that’s tied to a person – you think of them every time you enjoy it. Love the mini cobbler! Thanks…I love blackberry cobbler. This will be perfect as I won’t have a large cobbler leftover calling my name. There is also a PAF file to download and put all your family tree info in. Blackberries or any fruit with pie crust is a winner! Do think this would work in a 8×8 baking pan? Do you think I would need to double the filling? What a great story! Good luck with completing your family tree. I love making single servings in ramekins. These look wonderful. We can get fresh blackberries here still — I usually don’t buy them because they are the only berry Jamie doesn’t like. But I bet he would like them in a baked treat like this. Your photo reminded me of the Logan berries I grew up on grown in our area. I’m glad Bessie influenced your baking. The mini cobblers are cute and no doubt very tasty! How great to have a mini version you can whip up in no time! Good luck with the genealogy! That’s good to know! I’ve always been curious about ancestry.com, but have so little information about my ancestors, so I was thinking I’d be disappointed. Oh, and on the baking front, I think I’ll be making two of your recipes this weekend, the east breadsticks and the cobblers. One more thing. A lot of the records have old addresses on them so you can find an address where one of your great, great, grandparents lived and then look it up on Google Maps street view and see what’s there now. Jennifer, all you really need for birth dates is the approximate year. From there, you look at census, marriage, birth, war records that have all been scanned. It’s fun because in most cases you get to see a copy of the exact census or the old record with the relative’s signature on it. Love the photos! How much information do you need to find records at ancestry.com? Like if you have names, but no birth dates and little other information, is it do-able? I actually have frozen blackberries on hand, so I’ll have to make this as part of our Sunday dinner. I’ve never attempted to do any type of lattice with pastry, and with the smaller sized dessert, it looks more manageable. Krystle, I was worried the cobblers wouldn’t be big enough in the little ramekins (though I guess technically those are souffle dishes), but they’re the perfect small dessert. You can also assembled them ahead of time and bake when ready to eat. MaryEllen, I never realized how pretty she was! There were other pictures too. Amanda, let me know if you try making these with blueberries. What fantastic old photos! If Bessie was influential for what you do here on this site, then I owe her a thanks too. I enjoy waking up to your posts and trying to bake something new everyday. Cobbler would be new to me, but I only have frozen blueberries. After all, if Bessie used frozen berries, I can too. Louise, it wasn’t fancy but it was good cobbler! Katrina, you could probably make this with blueberries. Our blueberries are pretty reasonably priced too. 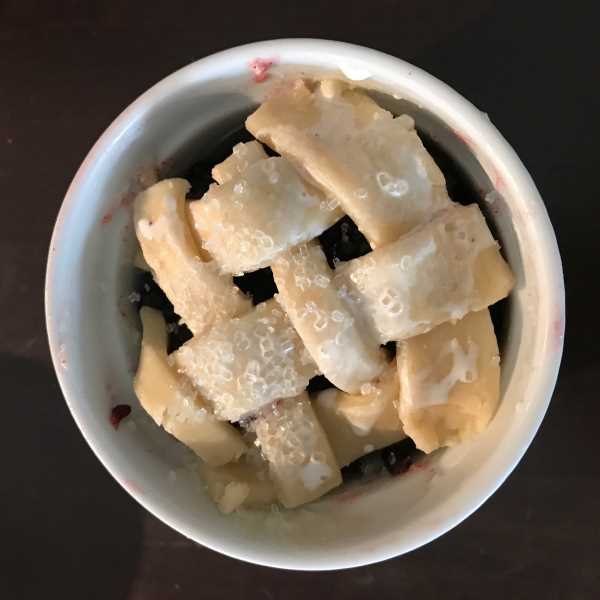 Another thing you can do with this cobbler is use the leftover filling (say you make 4 and only 1 or 2 people eat it) as waffle or pancake topping. What a great recipe and story in honor of Bessie. We love genealogy and finding our ancestors. I’ve bought blueberries lately that are good and make me happy to find in the winter. I was wondering what you were making. We get the berries really cheap too. Sometimes they are from Mexico, sometimes from Chile or Argentina. Blueberries and blackberries have been very tasty.